You know your pup would follow you to either side of the rainbow. With his loyal spirit, Toto was there to protect Dorothy from any nefarious encounters in both Kansas and Oz. He even pulled aside the screen that hid the wizard's not so intimidating figure from visitors. So there's a good reason to want to bring your dog with you everywhere you go, you never know what kind of truths your pup's nose might unearth. Thank goodness that Dorothy had her basket along when she landed in Oz. Little Toto often needed to be reeled in so he wouldn't frolic too far into the sleep inducing poppies or attack the angry apple trees. 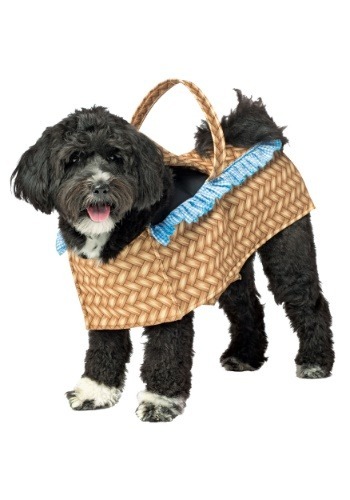 Also, what's more endearing than a dog traveling in a basket? Nothing that we can think of. Your pooch would be just as helpful as Toto was if you two were whipped beyond the rainbow. When you're dressing up this Halloween why not do a couple costume with your soulmate? You can find one of our great Dorothy costumes and your pooch can come along as Toto in his charming basket. We guarantee he'll like it better than getting carried in a real basket.